Homemade sausages may seem like a daunting task, but it's the perfect weekend kitchen project that ends with grilled sausages, beer and a feeling of pure pride and satisfaction. They were the star from our Oktoberfest party, and definitely try them with our Everything Pretzel Rolls. Call around to your local butchers and see if they have those to sell. Our neighborhood butcher didn't sell them, but (for you NYC-ers), the Meat Hook does. Just make sure they stay covered in salt before using. We say, to be safe, this is a 3 day process (freezing overnight + sausage making the next day). It's critical that at all times your sausage making equipment is frozen/extensively cold and your meat is cold too. If not, the fat will separate out and leave you with a sad looking sausage (that leaks and doesn't taste good). One day before making your brats, dissemble your sausage maker and freeze the metallic parts on a sheet tray. Rinse sausage casing in cold water until it is removed of all salt; at least 30 minutes and up to 24 hours. Three to four hours before grinding, cut pork, veal and bacon into 1"-pieces, place on a parchment-lined sheet pan and freeze. Grind the pork, veal and bacon on the largest die into a bowl that is set in an ice bath to keep cold. Freeze 20 minutes and repeat in the smaller dies, freezing after each grinding. Mix in spices until well-blended. Carefully slip on the sausage casing to the sausage stuffing nozzle, making a knot in the near end of the sausage. In groups push the spiced meat through to stuff the sausage. Note: this is most successful as a 2 person job, with one person pushing through the meat and the other carefully guiding the stuffed sausage so that it is equally stuffed. Once filled, tie the opposite end and poke any air bubbled with a metal cake tester. Measure about 5-inches, gently pinching the end to make space. 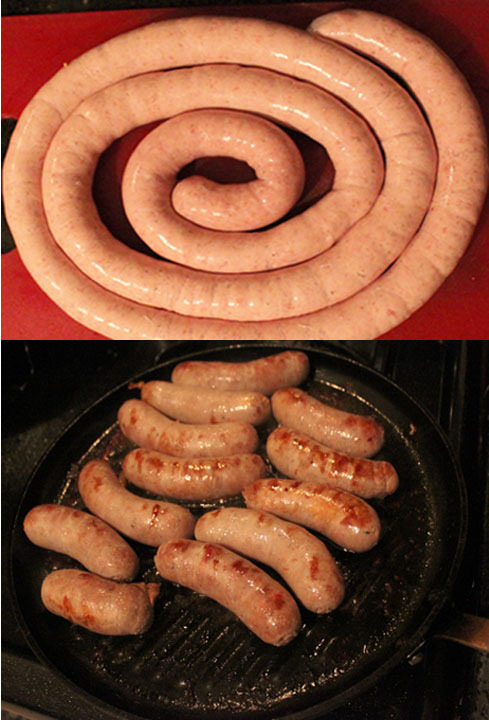 Twist the sausage in the same direction three to four times, to create a link. Refrigerate 12- 24 hours. If you're in a crunch, refrigerate at least 6-8 hours. Cook to your liking: we boiled ours in 4 cans of Oktoberfest beer and 1 thinly sliced onion for 10 minutes and then finished them on the grill (pan) until they were golden and had a crispy skin on all sides.